My friend Tommy and I were in Fort Lauderdale recently for a weekend, and on the way back to Central Florida, we wanted a quick lunch. I'd done a bit of Internet research and found this place called Bill's Filling Station which some boasted had the best hamburger ever. So we decided to try it ourselves and see. Upon doing my research, I saw that Bill's Filling Station was in Wilton Manors, a primarily gay area of Fort Lauderdale. So bet it, good food is good food. So on our way out of town, I got out my trusty iPhone and guided us to it. Well, the sign out front said "enter in the rear" so we drove around to the back. Good, there was a big parking lot. We entered Bill's Filling Station, but thought we were in the wrong place. It appeared to be a bar, a very empty bar at 1 PM on a Sunday afternoon. But we asked one of the two people that were there (well, there was a third, the bartender), and were told that we were in the right place and that they had the most awesome burgers in the world. So we sat down and proceeded to order. We both ordered the hamburger with cheese, and onion rings as a side. They have a daytime special, and so our burger with cheese and a side also came with a drink--soft drink, bottle of water, or a domestic beer--for $6 plus$1 for the cheese---huh, only $7 for a half pound burger, side of onion rings, and a domestic beer? Yep. Wow, what a bargain. In due time, our meals arrived. What can I say? The burger was pretty gosh-darned good. Was it the best burger I've ever had? No. But was it pretty good? Yes, it sure was. The burger itself was moist and juicy. I had mine dressed with lettuce, tomato, onion, cheddar cheese, and jalapenos. It was excellent. The bun, too, was very good. The onion rings were a bit greasy and had a lot of coating. The few that were substantial portions of onion were good, but many of them were very thin on the onion and so mostly breading. The breading itself was good, there just needed to be more onion. 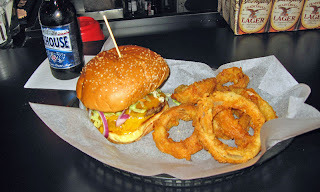 Tommy agreed with me, this was a pretty good burger indeed. Maybe not the best in all the world, but still, a pretty good burger. I'd have one again.